The European Commission claims that TTIP will benefit small and medium enterprises (SMEs) but the opposite is true. Only very few SMEs are engaged in transatlantic trade and the possible negative effects are way more than any opportunities for SMEs. Small and medium sized business which are the backbones of our economies have started to organize themselves and speak out against TTIP. Below you will find key ressources on SMEs and TTIP as well as links to initiatives from SMEs against TTIP. 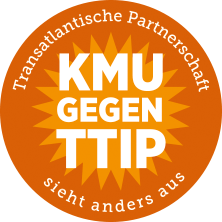 The study argues that most SMEs wont profit from TTIP but on the contrary will suffer from it. In those sectors which are most engaged in exports SMEs are underrepresented. Also companies that have trade relations with the US are less than 1% of all companies in both Germany and Austria and are most likely big corporations. SMEs are likely to suffer from TTIP. Cheap competition form transnational coporations in their markets and public procurement on the local level will harm them. Very good collection of statements country per country. Many links. Important arguments from the Movement for Responsibility in Trade Agreements (More) along the lines of 5 major question SMEs must ask themselves. Ecopreneur.eu, the European umbrella organization of national green economy associations, is criticizing the latest EU Commission report on small and medium-sized enterprises (SMEs) and the Transatlantic Trade and Investment Partnership (TTIP) as incomplete and misleading. Article on the negative effects of TTIP on SMEs in French. Article on the negative effects of TTIP for SMEs on SME-Insider a UK based news and analysis platform for SMEs. Article by Corporate Europe Observatory (CEO) on the difference of what big business and the European Commission say about the benefits of TTIP for SMEs in the public and behind closed doors.